And lots more! Go ahead click and explore! This organization is busy! All ages both men and women are actively having fun with wood turning! If you enjoy wood turning and enjoy learning new skills and meeting fellow wood turners, then the Arizona Woodturners Association (AWA) is a great venue. What is AWA and AAW? The Arizona Woodturners Association (AWA) in Phoenix, Arizona is a proud chapter of the American Association of Woodturners (AAW). We are dedicated to training, preserving and inspiring the art of woodturning. We are excited about the revival interest in woodturning. People's imaginations have shown the world that turning is a true and pure form of art. This organization is busy! All ages both men and women are actively having fun with woodturning! 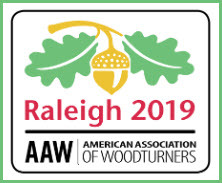 We encourage each of our members also to join the American Association of Woodturners. The information you can gather thru this national organization is second to none. AAW membership includes: 2800 online projects, articles, videos and tips; 360 online videos searchable by topic; 12,000 images of member work for inspiration and ideas; 365 affiliated chapters to search (when you are traveling, stop in at a club); back issues of magazines and publications to browse; symposiums - just to mention a few benefits! Check out AAW today! You are welcome to join us for our next meeting! We are doing a photo directory! As our club grows it is great to put a face with a name (or name with a face) after you leave the meeting. Be sure to get your picture taken at a meeting. The photo directory will be in the Members Only section - goal will be May 1st! Stay tuned! !